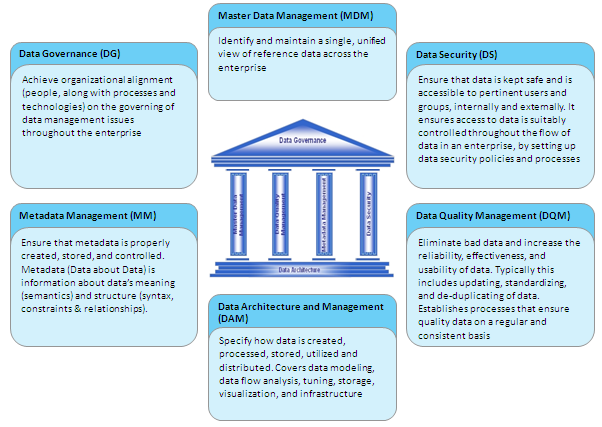 Data Architecture & Common Data Model: Institution of best practices in data architecture within the organization including establishing a common, open-ended data model framework that will be maintained and will grow with the organization. Data Management and Data Governance: Establish oversight and accountability functions to ensure data quality and consistency as part of a Data Governance program through the implementation of data ownership and stewardship responsibilities. Integrating fragmented data architectures has emerged as one of the greatest challenges facing IT and business. Business prosperity increasingly depends on a global view of customers, suppliers, products and partners, which is not achievable without data integration. Service Oriented architecture helps to build a framework for enterprise application integration and enterprise data integration technologies to complement each other. Data Semantics: The business context behind data definitions like customer address, product category or employee type. Data Quality: Improving the accuracy and consistency of the data between different systems. Data Governance: Data and meta-data lineage, management, documentation, reporting and auditing tools that help SOX and other regulatory requirements. Data Access: Broad reach into structured, semi-structured and unstructured data in hierarchical and relational databases, mainframes systems, files, documents and applications. Bulk Data Processing: Support for processing large data volumes, including changed data capture (delta changes for faster performance). Data Profiling: Thorough, accurate information about the content, quality and structure of data virtually in any system. Data Cleansing: Resolving missing data fields, correcting conflicting data and managing data relationships and hierarchy resolution to ensure the quality of data supplied to business. Data Transformation: Creating a consistent view of data irrespective of its source, structure and business semantics. Data Federation: Federated access and integration of data cannot be copied or to avoid data latency or cost issues of building a physical data store. Data movement: Flexible data and right-time data delivery whenever required. Data Lineage, Data Reporting and Meta data Analysis: Reporting, analysis and auditing of data and meta-data for improved visibility and control.